Heat oven to 450° F. On a rimmed baking sheet, toss the bell peppers and garlic with 1 tablespoon of the oil and ¼ teaspoon each salt and black pepper. Roast until tender, 12 to 14 minutes. Meanwhile, heat the remaining tablespoon of oil in a large skillet over medium-high heat. Add the onion and ½ teaspoon salt and cook, stirring occasionally, until beginning to brown, 3 to 5 minutes. Add the beef, corn, and chili powder and cook, stirring occasionally, until the beef is browned, 6 to 8 minutes more. Divide the beef mixture among the tortillas and top with the avocado, Cheddar, salsa, and cilantro. Serve with the bell peppers and lime wedges. Love recipes where I can enjoy delicious food and still watch my diet. This recipe from Better Recipes does just this very successfully. Preheat oven to 500 degrees. In a small saucepan over medium high heat, bring water to a boil. Stir in couscous, cover, remove from heat and set aside for at least 5 minutes. Meanwhile, in a large skillet over medium high heat, cook pork, stirring occasionally and breaking up, until no longer pink, about 4 minutes. While couscous is softening, remove tops from peppers and scrape out seeds, then set aside. In a large bowl, combine couscous, pork, salsa, corn and chili powder. Season with salt and pepper to taste. Fill peppers with pork mixture. Arrange peppers in a shallow baking pan and bake for 10 minutes. Sprinkle cheese on top, then continue baking until peppers are tender and stuffing is heated through, about 5 minutes. Serve peppers with additional salsa on the side. Materials needed: Large Craft Sticks, Red/White/Blue Paint, Paintbrushes, Pencils, and Smocks (or an old T-shirt) to protect clothing. Each flag puzzle will need 7 craft sticks. 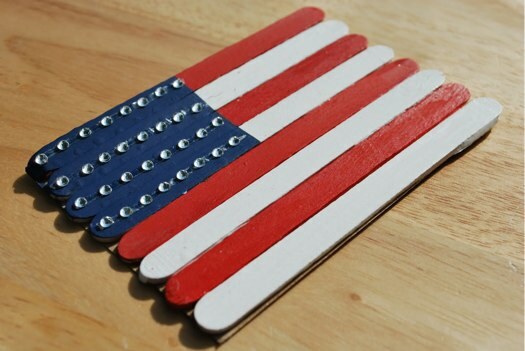 On 3 of the craft sticks mark a line vertically to divide the craft sticks that will be painted with TWO colors (to form the blue area of the flag). Have the children paint 2 craft sticks WHITE, 2 craft sticks RED, 2 craft sticks BLUE/RED, and one craft stick BLUE/WHITE. Allow the craft sticks to dry thoroughly. When dry, scramble the craft sticks and ask the children to put the “flag” puzzle together. If desired, the children can use foil stars to decorate the blue area of the flags. I love this picture that a friend recently shared with me. How beautiful all the wonderful colors as the day begins to settle.